We are pleased to invite you to the International Staff Week of Esaip - Graduate school of Engineering, which will be held from June 12th to 15th 2018. The main purpose of our Staff Week is to widen and strengthen the cooperation with our partner institutions, to share our different experiences on internationalization, to facilitate networking and establishment of new partnerships. You will have the opportunity to learn from the experiences and good practices of all participants. 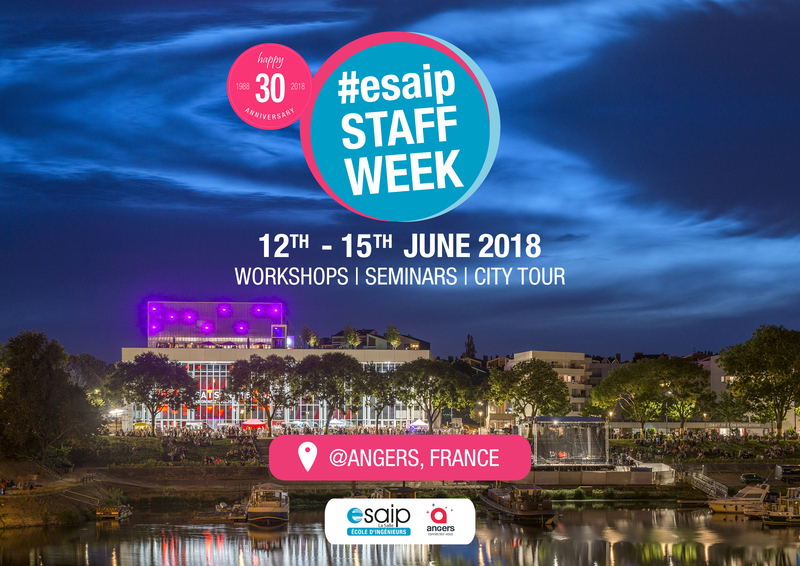 In addition, we want to invite all guests to exchange ideas about fostering student and staff mobility, to present their home universities, structures and working practices, to explore and discuss special topics of interest within the field of internationalization and to discover the city of Angers. On top of that, ESAIP will be celebrating its 30th anniversary in 2018. We will be pleased to welcome you for our graduation ceremony to end our Staff Week on Friday June 15th. More information on the program, accommodation and the application form can be found on our website HERE. Please make sure to apply before April 30th 2018 by filling the google form HERE.